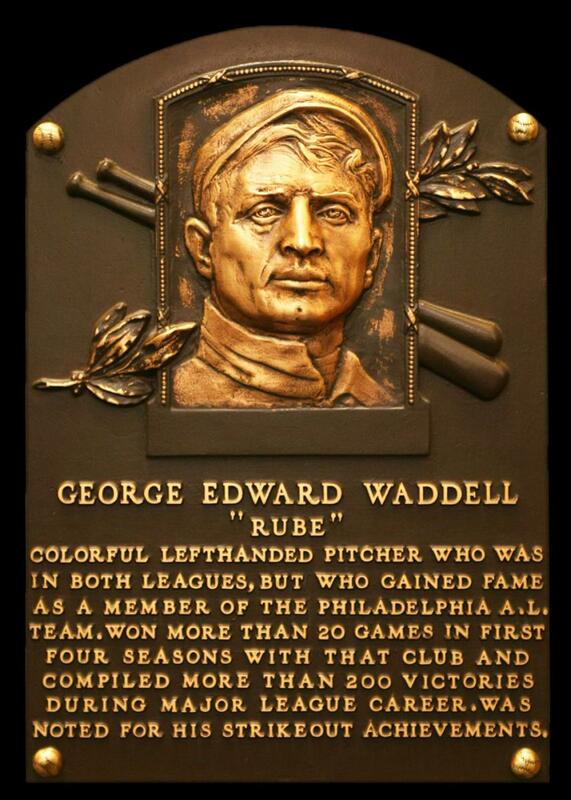 "He had more stuff than any pitcher I ever saw," legendary manager Connie Mack once said about Rube Waddell. Mack knew that as well as anyone. As Waddell's manager with the Philadelphia A's starting in 1902, Mack helped the young lefthander harness his electric fastball, devastating curveball and baffling screwball. Waddell posted the first of four consecutive 20-win seasons that year, and led the American League in strikeouts for each of the next six seasons. On July 1, 1902, Waddell became the first pitcher in major league history to strike out the side on nine pitches. In 1903, Waddell struck out 302 batters—115 more than the runner up. The following year, he fanned 349, to lead the league by 110. No other pitcher would post back-to-back 300-strikeout seasons until Sandy Koufax in 1965-66. In 1905, Waddell won the AL's pitching Triple Crown, leading the league with 27 wins, 287 strikeouts and a 1.48 ERA. Waddell was instrumental in the early growth of the game, as one of its first real drawing cards and one of its first honest-to-goodness celebrities, as biographer Alan Howard Levy wrote. As dominant as Waddell was on the mound, he might have been just as notorious for his unpredictable behavior off the field. Born in Bradford, Pa., Waddell earned the nickname "Rube"—a term commonly used to refer to farmboys—because he was a big, fresh kid. He broke into the big leagues with the Louisville Colonels in 1897, and he spent two years with the Pittsburgh Pirates before arriving in Philadelphia. Waddell had a habit of leaving the dugout in the middle of games to follow passing fire trucks to fires. He performed as an alligator wrestler in the offseason, and also played professional football in the first National Football League, as a fullback for the Philadelphia Athletics in 1902. Newspapers of the time referred to Waddell as "eccentric." Others called him "screwball" or "nutsy." Waddell also battled alcoholism for much of his adult life, and he reportedly spent the entirety of his first signing bonus on a drinking binge. He was so bad at holding onto money that the A's once paid him in dollar bills, in the hopes it would slow down his spending. Waddell's drinking led to constant battles with his managers and scuffles with teammates, and after the 1907 season the A's sold him to the St. Louis Browns for $5,000. He posted another strong season in 1908, and Browns owner Robert Hedges hired him as a hunter over the next two winters to try to keep him out of trouble. He was released in 1910 and never pitched another major league game. He died of tuberculosis four years later, at the age of 37. For all his personal demons, Waddell's brilliance on the mound was unquestioned. "In my opinion," pitching great Walter Johnson once said, "and I suppose if there is any subject that I am qualified to discuss it is pitching, Rube Waddell had more sheer pitching ability than any man I ever saw." The last game of base ball of the season took place in this city last Thursday between the Kenosha and Burlington nines, in which the former were victorious by a score of 11 to 6. Waddell, who was in the box for Burlington, made a good showing but the playing of the rest of the team was so poor that the Kenoshas were easily victorious. On Sunday the Burlingtons went to Kenosha and played a return game, in which Waddell also pitched for the Burlington team and struck out seventeen men. The home team were victorious and won the game by a score of 6 to 5. The Burlingtons scored two runs in the third inning and four in the sixth, while Kenosha tallied two in the third and three in the seventh. A Kenosha dispatch of last Friday says that "Rube" Waddell, the famous Chicago pitcher, to-day signed a Kenosha contract and will appear in the box for the Kenosha team after next Sunday. For the past two weeks Waddell has been with the team at Burlington and yesterday the Burlington team was defeated by a score of 11 to 6 by the Kenosha players. Waddell came directly to Kenosha to join the local team. Next Sunday Waddell will pitch for Burlington but after that game he will wear a Kenosha uniform. Waddell has been employed at the Grant hotel in this city. He is now making an effort to organize a football team to play during the fall months. With the signing of Waddell the Kenosha team will make a bid for the state championship. Sunday, Oct. 13, the local team will play the Appleton team and on the following Sunday the Racine team will be given a chance to defend her claims to the championship of southern Wisconsin. 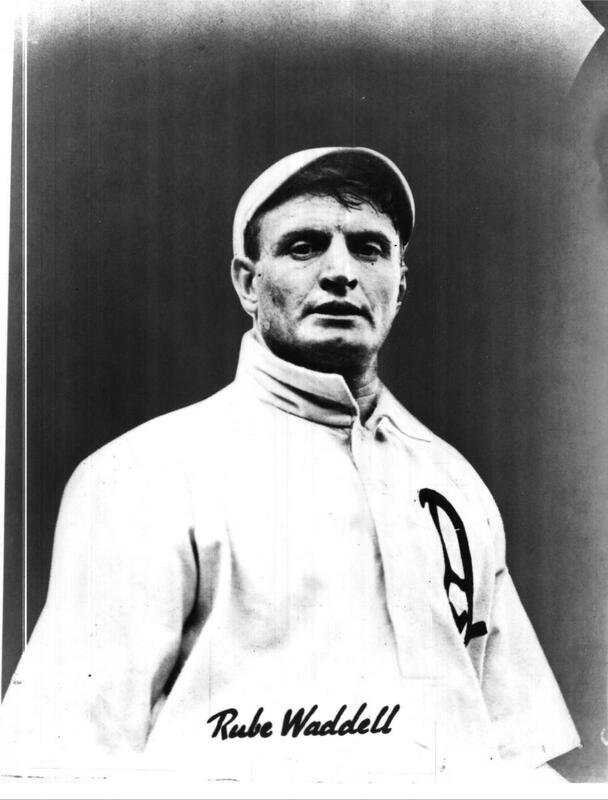 Remember Rube Waddell, The Pitching Ace of 1910? "Why sure! Sure I remember Rube Waddell comin' to Burlington. Heck, I remember the time he picked up a ball and threw it so hard it went right through the door of the old barn that used to stand right over there," was one remark. Talk to any of the older baseball fans and players of the city and they can relate tales of the famous southpaw and his escapades here. Waddell who pitched the Philadelphia Athletics to their first pennant in the American League is one of baseball's greats, known not only for his prowess on the mound but also for his erratic personality and many idiosyncrasies. Rube's managers never knew if the farm boy from Pennsylvania would be with them for an entire season. While he was with Connie Mack's Athletics, Rube left the team three years out of four before the season came to a close. One day he'd report in and the next he would have disappeared without a word of where he could be reached or when and if he would ever be back. Where did Rube go? What did he do? In answer to the first question, he traveled all over the country and no doubt there are many small town citizens who can talk of having associated and of even playing ball with the man whose likeness occupies a place in Cooperstown's "Hall of Fame." Waddell liked to fish. It was not an unfamiliar sight for Burlingtonites to see his tall, lanky figure perched on the bank of the river at the Mill Pond, dozing in the sun and waiting for a jerk on his fishing pole. Sometime before 1910 Rube pitched one game for the old Burlington semi-pro team. Paul Dickey, who later was to become a renowned author, played second base in the game. Harry Reynolds took first base with "Pac" Curtis on third. The late Al Konst caught Rube's pitches. Waddell pitched a shut-out and that was the year Burlington won 17 straight, including wins over the House of David, the Cuban Giants and the Bloomer Girls. As the story goes, old Rube was to have pitched a second game, against Kenosha here. But Kenosha took a long shot on the knowledge of Waddell's weakness for alcoholic beverages and came over early. By the time the game was supposed to start Kenosha was all set. So was Rube! It is said that Waddell tended bar at the old Hotel Burlington. It is also said that he had a girl friend in Burlington. Knowing of his escapades and knowing that he was married three times, all three ending in the divorce court, it is very possible that there might just be a bit of truth to the tales. The "headache" of baseball had as fantastic a career on the diamond as off. In his best season he won 22 games while losing 16 for the Athletics. He won 194 games while losing 146 in sections of 13 major league seasons. He held his opponents to 2.74 runs, earned and unearned, per nine-inning game. He struck out ten or more batters in a game sixty times. Sports writers who liked and disliked him all admitted that Waddell was the greatest drawing card in the country in his day and that he had more stuff than any pitcher who ever lived. All men grow old, however, and the time came when Rube began to lose ground. He slipped from the major leagues to the minors. His last pitching was for Virginia, Minnesota in the Northern League. While in Kentucky one year Waddell contracted pneumonia and that started his fight against ill health. In 1913 Rube went to St. Louis, suffering from tuberculosis of the throat and exhaustion. Friends provided him with enough funds to get to Texas. It was too late in the stage and on April 1, 1914, George Edward Waddell died. "Why sure! I remember Rube Waddell. Why I remember the time he . . . .."
And so the story goes . . . . for what baseball fan doesn't know Rube Waddell, or at least of him. He was one of the most dynamic characters, one of the greatest pitchers, and perhaps one of the least understood immortals of the ball and bat sport in its entire history.